Smartphone for giants. Hold a 10.1-inch tablet to your ear and make a call? Strange idea, but Samsung has offered this feature for a couple of years now. 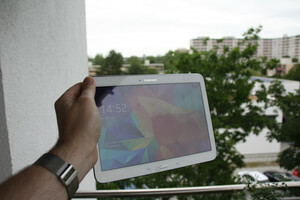 Our review shows why the fourth generation of the Galaxy Tab still stands out from the competition. 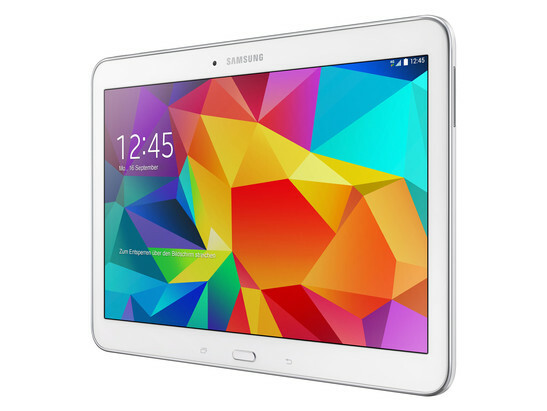 If you want an inexpensive Android tablet from Samsung with good specifications, you will quickly find the Galaxy Tab 4. 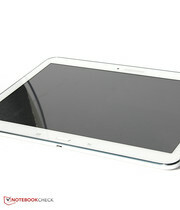 It looks like a usual tablet at first with a Wi-Fi or even LTE module, which is available in the colors black and white and two sizes: 10.1 inches and 7 inches. However, if you have a closer look at the 10.1-inch version, which we review today, you can see a curious icon on the home screen when first starting it up: "Phone". 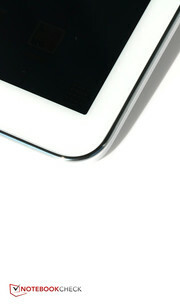 So tablet users might wonder if they accidentally got a smartphone for very big people instead of a 10.1-inch tablet? No, the Galaxy Tab 4 10.1 is obviously a real tablet that can also be used to make calls, for example with the hands-free feature or a headset. And what changed compared to the predecessor Galaxy Tab 3 10.1? Actually, not a lot: The processor even has a lower nominal clock, but you get a quad-core CPU this time. You also get 500 MB more RAM and the weight was slightly reduced. Are these changes sufficient to keep up with the tablet competition? Consider that the advancements for 10.1-inch tablets are slower than smartphones. For instance, the Google Nexus 10 is almost two years old but still on sale. If you want more performance, you should have a look at the Galaxy Tab Pro 10.1, the LTE version has a phone function as well. Microsoft's Surface 2, the Slate 10 from HP, the Lenovo Yoga Tablet 10 HD+ and even the QV1030 from the phone manufacturer Gigaset do not offer this feature, but have other advantages in return. Made of plastic, well built and elegant: The case. 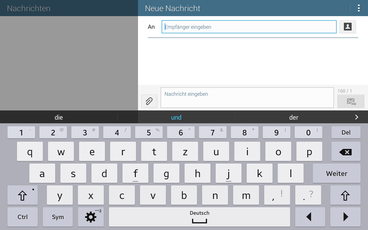 Put the Galaxy Tab 3 10.1 and the Tab 4 10.1 side by side and you will have a hard time to distinguish them. You have to look very closely to find any differences: The Galaxy Tab 3 10.1 has a surrounding frame that looks like brushed aluminum, but this frame is just white in the case of the Galaxy Tab 4 10.1. 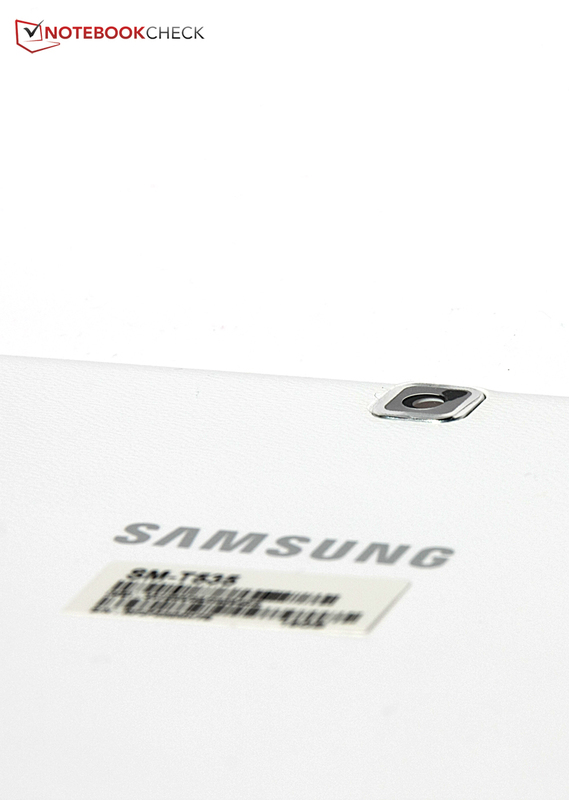 The Tab 3 10.1 also has a visible light sensor next to the front camera, the Galaxy Tab 4 10.1 does not. 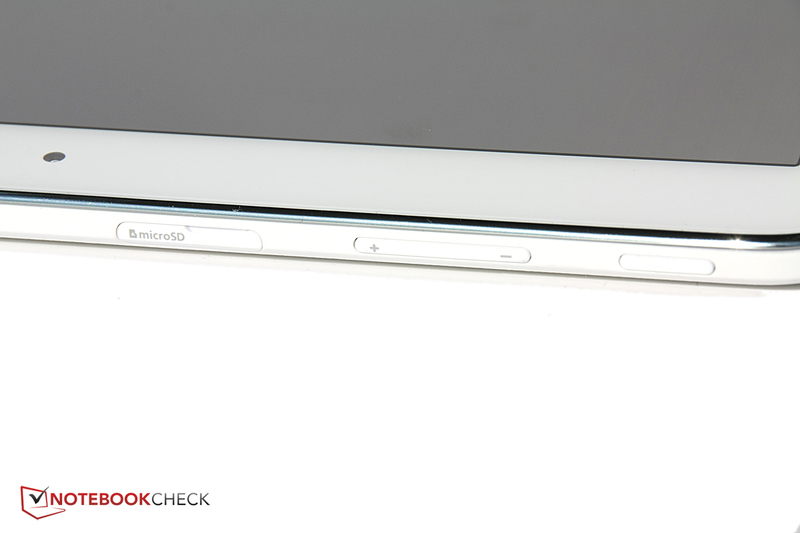 Dimensions are identical as well, except for 0.3 millimeters (~0.01 inches) more length and width for the Tab 4 10.1. You might notice a weight difference since the new Tab 4 with 10.1 inches is 25 grams (~0.9 oz) lighter than its predecessor. Otherwise, the case is once again made of polycarbonate, but its looks classy thanks to the simple design and the small chrome colored frame that surrounds the front. The back is matte and reminds us of fine leatherette with a roughened structure. This means you always have good grip, but the stability is just average: You can easily twist the case, which produces picture distortions and you can hear creaking sounds in the process. The connectivity did not really change compared to the predecessor, either. 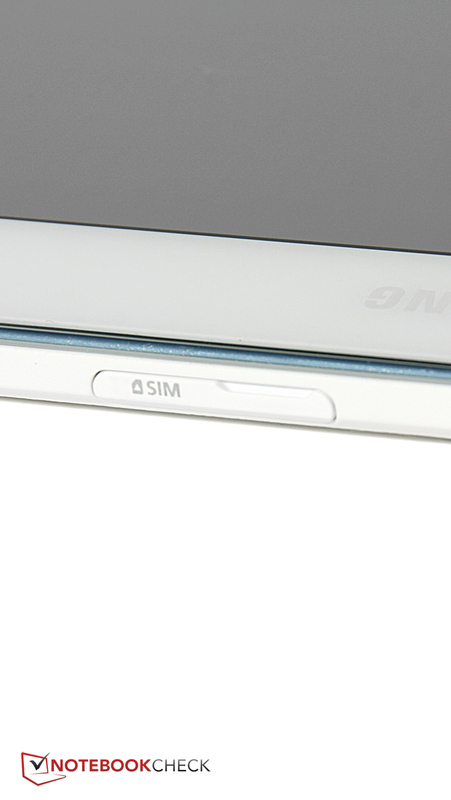 Apart from a micro USB 2.0 port, a MicroSD slot, the headset port and the SIM card slot for our LTE model, there are no physical connections. This means the Galaxy Tab 4 10.1 is not up to date anymore: Some tablets already use a USB 3.0 port for quick data transfers between tablet and PC, for example the Microsoft Surface 2. The camera has not been improved, the display still uses the 720p resolution and the Galaxy Tab 4 even lost the MHL feature. In return, you get LTE Cat.4 for faster web browsing. The software was updated to the current Android version 4.4.2. As always, Samsung includes its TouchWiz user interface, which changes more than just some visual details. However, it is still pretty easy to learn and offers many features for users from other Android devices or even newcomers. Samsung gets some money for preinstalled advertisements and also installs some apps that are deeply integrated into the system, which makes it quite hard to remove them. The phone feature might look a bit absurd at first. However, there are probably many people who carry their tablet around with them all day. Why then should they also carry a smartphone if they can instead use the hands-free feature (or a headset) for calls from the tablet? You can obviously also hold the Galaxy Tab 4 10.1 to your ear, but that would be very tricky with just one hand and would look pretty strange. It also would not help very much, since the sound is only produced by the two speakers at the sides or a headset. The sound via speakers is pretty loud, but also distorts a bit. Unfortunately, Samsung does not include a headset, an accessory, which would never have made more sense. The phone app obviously has a lot of space on the huge display and is therefore clear. Similar to Galaxy smartphones you can create contact groups and favorites. 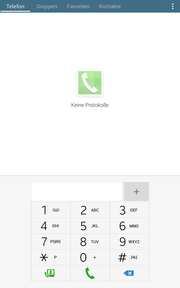 Video calls can also be launched via the keyboard. The voice quality during a call is decent, and the recipient can understand us pretty well. However, background noise is not always filtered perfectly and sometimes even enhanced by mistake, so there might be some issues in loud environments. Unfortunately, the communication modules of the Samsung Galaxy Tab 4 10.1 leave mixed impressions, especially in comparison with the predecessor. The latter only supported Cat.3 LTE with maximum download speeds of 100 Mbps, but you also got NFC for short-range transfers. The Tab 4 supports LTE Cat.4 with download speeds up to 150 Mbps, but you do not get NFC anymore. The signal quality is decent, and we always got a signal in the metropolitan area, even in the moderate German E-Plus network. Outside the country, you can use four GSM bands, four UMTS bands and five LTE bands, so you should be able to use a network in most countries. The WLAN module supports the standards 802.11 a/b/g/n, but not the latest ac standard. The WLAN signal is very good; we still had the full signal even with a distance of ten meters (~33 feet) from the router and through three walls. Another wall and three more meters (~10 feet) and the signal fluctuated between two and three out of four bars. The GPS module does a good job. 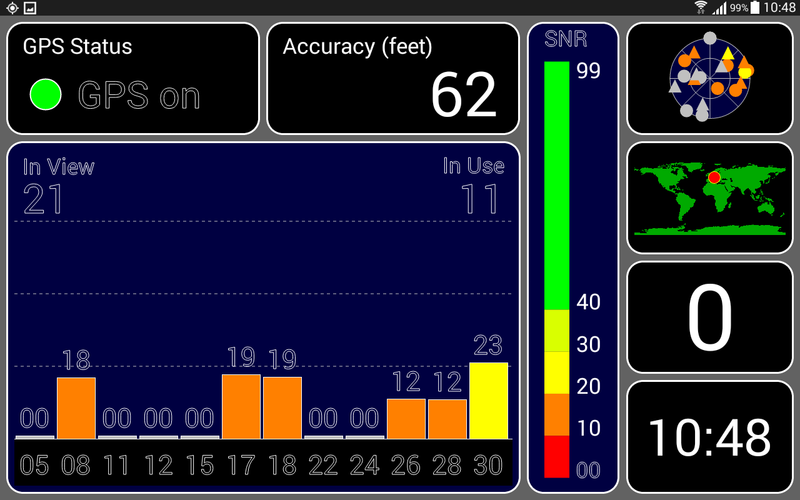 It quickly locates your position outdoors with an accuracy down to 7 meters (~23 feet). The accuracy is much worse indoors, but the tablet was still able to locate the position, which is not a matter of course. How important is the camera of a tablet? There are many different opinions about that, and many earlier tablets did not even have a camera. 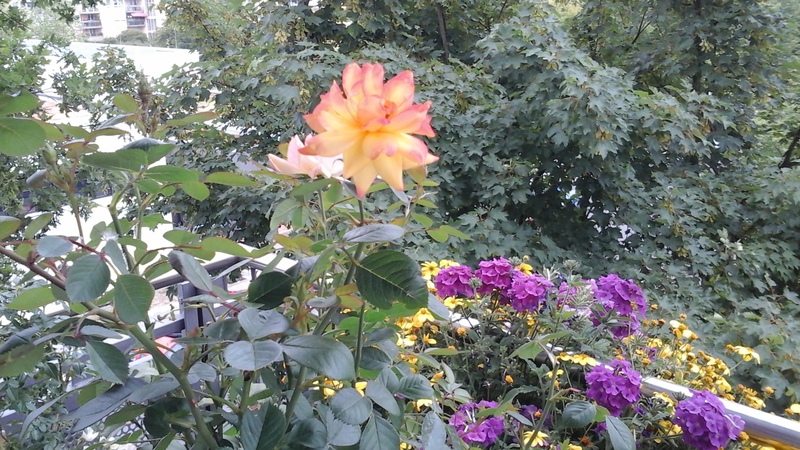 It is still not as important as a camera in smartphones, at least if you look at the quality of most tablet cameras. 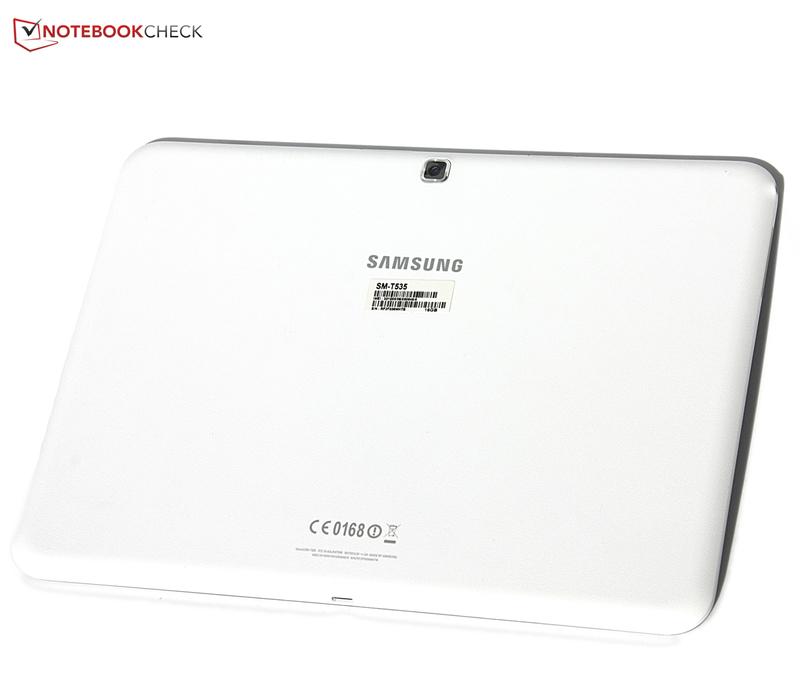 The Samsung Galaxy Tab 4 10.1 obviously only has a mandatory camera that does not really want to shine in this discipline: A resolution of 3 MP at the back and 1.3 MP at the front; there is no LED flash. The number of megapixels obviously does not tell the whole story about the camera quality, but the comparison pictures quickly show that the results of the rear camera look rather blurry. You can hardly see any details when you zoom in and the picture is not very sharp. The front camera does not take sharp pictures, either, but is sufficient for video calls. Apart from the power adaptor and a separate micro USB cable, the box does not contain any accessories. 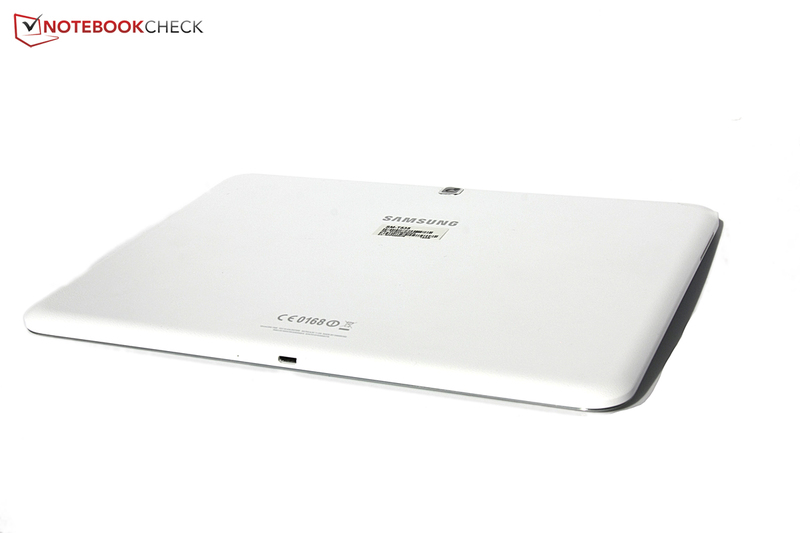 We also could not find any specific accessories for the Galaxy Tab 4 10.1 on Samsung's website. Samsung grants a warranty of 24 months for the tablet, however, the power adaptor and the USB cable are only covered for six months. You can also use Samsung's service when you are in another country if the Galaxy Tab 4 is available there as well. The capacitive touchscreen of the 10.1-inch tablet is a good input device: In 99 of 100 cases, you will hit the correct button, even in the peripheral zones. However, the touchscreen sometimes does not understand what we want and scrolls to the next side, even though we wanted to use the Google search field. Fortunately, this is very rare. 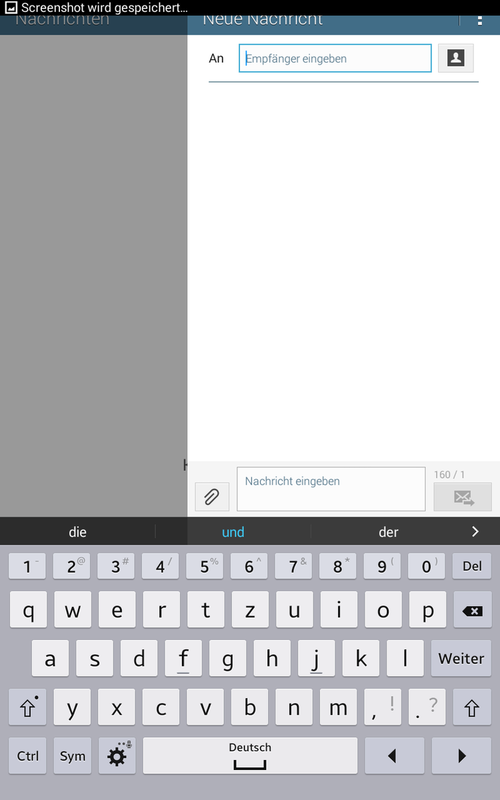 Samsung veterans are already familiar with the keyboard, and it obviously benefits from the screen size. It is unfortunate that the German keyboard does not support umlauts and certain characters like "ß"; they can only be used when you hold down the corresponding vowels or consonants. In return, you get a delete key to remove the characters behind the cursor and two arrow keys to shift the cursor. There is even a Ctrl button for key combinations like Ctrl + C for copy. We have desired these little helpers for other on-screen keyboards for a long time. All the hardware buttons are at the top of the device. The power button and the volume rocker are easy to feel and to operate. Unfortunately, the volume rocker does not change its controls according to the display orientation, so we have to use the lower button to increase the sound in portrait mode, which is a bit weird. It is somewhat disappointing that Samsung once again uses a panel with a resolution of 1280x720 pixels. Considering the comparatively large 10.1-inch display, you can actually see differences to higher resolutions. Only the HP Slate 10 has such a low resolution within this comparison, but its price is also much lower than the Samsung Galaxy Tab 4 10.1. 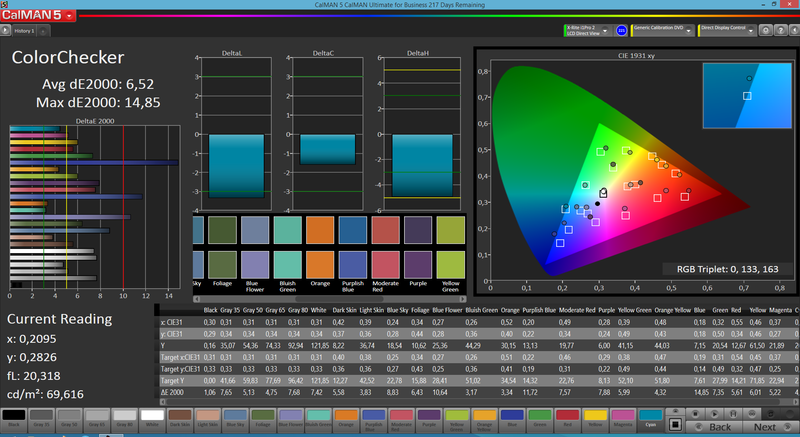 At least the brightness of the panel is good and surpasses all displays within the comparison: 401.9 cd/m² is the average luminance with a very even brightness distribution of 92%. The Samsung Galaxy Tab 4 10.1 is on the same level with the rivals in terms of contrast, however, we would have expected more from the manufacturer of the excellent AMOLED displays of the Galaxy S5 or other devices. 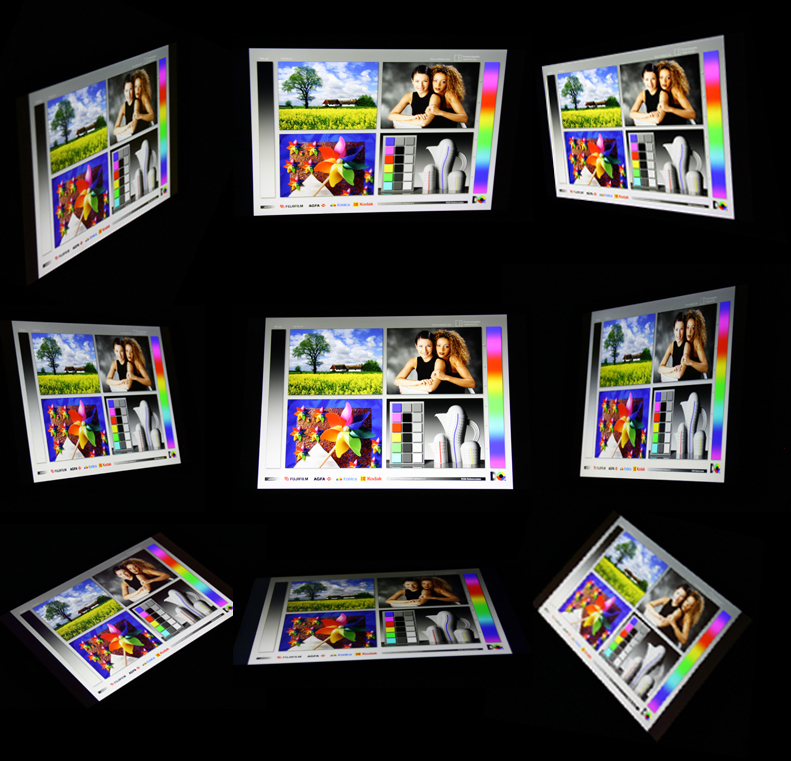 This time you "just" get a standard panel with TFT technology, which results in a comparatively high black value of 0.61 cd/m². As a result, black surfaces have a visible gray film. The color presentation is decent, despite the average contrast ratio of 685:1. Colors appear colorful, but not as rich as other devices. This device does not support the settings via preinstalled profiles that we know from other Samsung devices, and you will have to live with the default settings from the Samsung engineers. 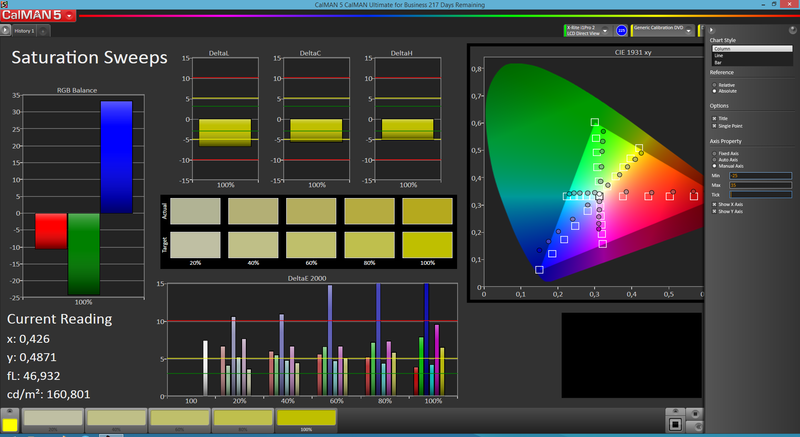 We have a closer look at the default settings with a colorimeter and the software CalMAN. 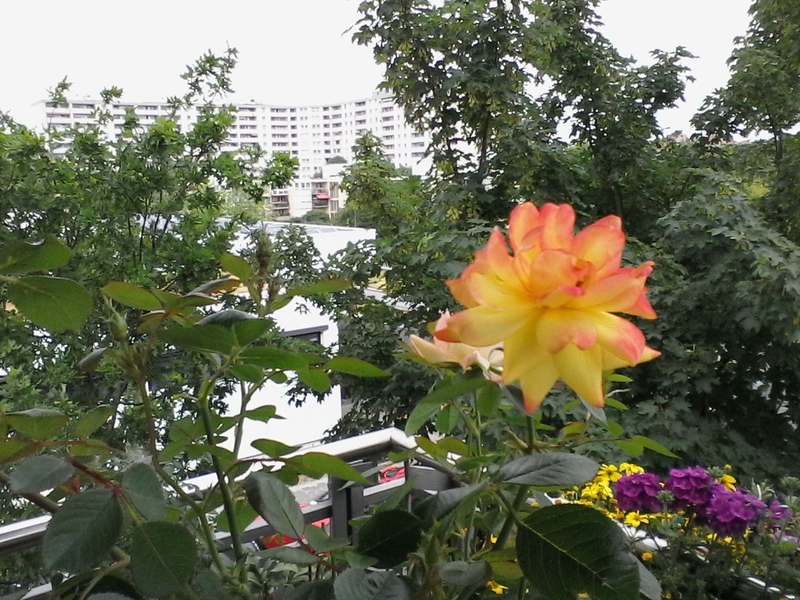 The somewhat pale color impression is a result of the color balance. Red and blue are too pale, while green colors are too strong. It seems that the engineers wanted to compensate this fact by the saturation, where blue is too strong and green is too pale. 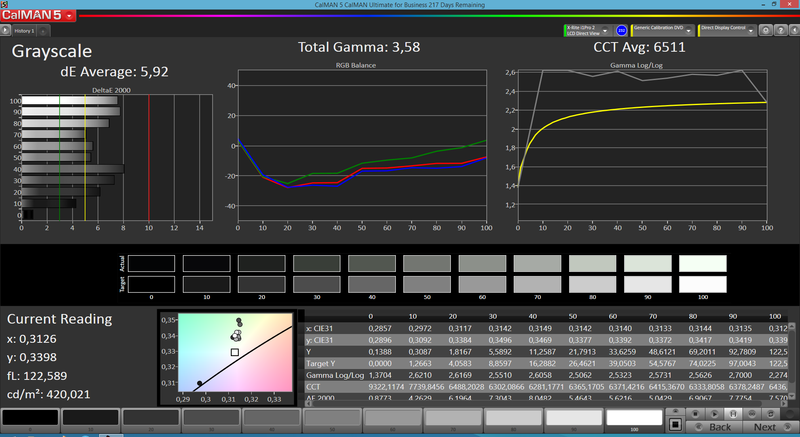 All in all, these settings work, only blue colors show pretty large deviations compared to the reference color space. You should not rely on the color presentation if you edit pictures. You can already see annoying reflections on the display glass from many perspectives in bright rooms, and the situation is obviously not any better under sunlight. Thanks to the comparatively high brightness, you can still somewhat see the display content with the reflections, but that is tiring for the eyes. Even though it is not an AMOLED display, the viewing angle stability is still very good: Only very flat angles can be an issue, otherwise we cannot see color distortions or brightness changes. 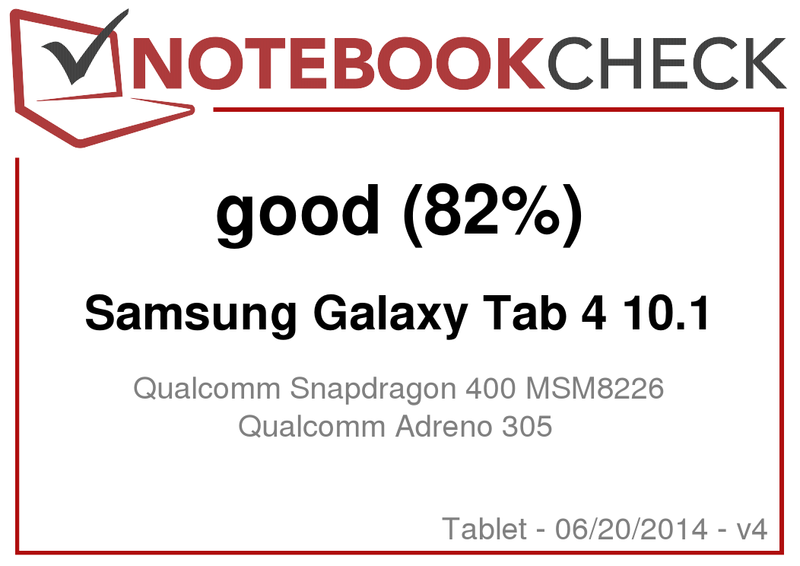 The Galaxy Tab 4 10.1 now uses a quad-core SoC, more precisely the Qualcomm Snapdragon 400 MSM8226, but with 1.2 GHz instead of 1.6 GHz it is lower clocked than the predecessor. How will this affect the performance? The new SoC is roughly on the same level with the Galaxy Tab 3 10.1 in the synthetic benchmarks, but the four CPU cores result in advantages for optimized apps and during multitasking. A higher nominal clock would definitely improve the performance, but we did not encounter any hiccups when we used it. There were no problems with any apps that we tested. The 3D performance is slightly behind devices with a PowerVR SGX544 (Galaxy Tab 3 10.1, Lenovo Yoga Tablet 10 HD+), and the Microsoft Surface 2 is even significantly faster. 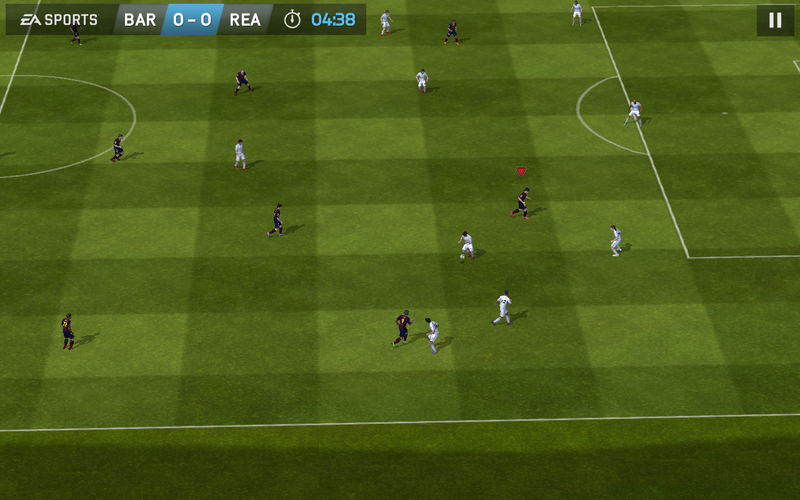 Still, the power of the GPU should be sufficient for most current games in the Play Store. However, the performance during web browsing, especially with HTML5 websites, is much faster on other tablets: The Microsoft Surface 2 in particular has clear advantages. The 16 GB storage on the other hand delivers data quickly to the processor, graphics card and memory. There is no tablet within the comparison, in terms of neither sequential nor random accesses, which is faster. Only the Galaxy Tab 3 10.1 and the much more expensive Galaxy Tab Pro 10.1 are a bit faster when it comes to sequential reads. Even though there are certainly more powerful GPUs than the integrated Adreno 305, we had no problems with 2D or 3D games. We played "Lego Star Wars: The Yoda Chronicles" with its large number of units on the screen and it was just as smooth as the racing game "Real Racing 3", the soccer game "FIFA 14" or "Iron Man 3". How the performance will be in the future is another question: The GPU will reach its limits faster than other models when the games get more demanding in terms of graphics. So the question is, how long do you want to use the tablet. 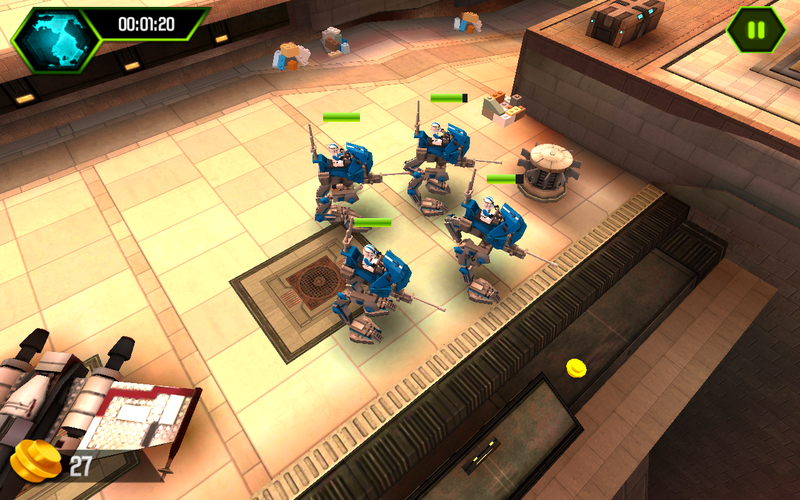 Just like "Lego Star Wars: The Yoda Chronicles" with many units on the screen. Since the performance of the SoC is not pushing any limits and there is comparatively plenty of space inside a 10.1-inch case, the surface temperatures are always pleasant. The average warming of the front under load is just 2 degrees (~3.5 °F) higher compared to idle operation. Up to 36.3 °C (97.34 °F) under maximum load can be felt, but it is not uncomfortable. We can feel a slight warming compared to the environment during long idle periods, but the overall temperatures are not very high. We were not really convinced by the speakers of the Galaxy Tab 3 10.1: They were very loud, but sounded tinny and the sound was very distorted at the highest volume. The bass was not really present, either. Unfortunately, that did not change in the case of the Galaxy Tab 4 10.1: The speakers have the same issues; HTC's One M8, Samsung's own Galaxy S5 or the Surface 2 showed how it is done. In terms of power consumption, the Samsung Galaxy Tab 4 10.1 is a very frugal tablet. 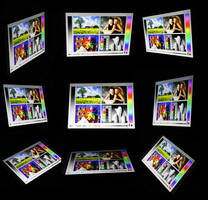 Compared to the predecessor, it uses less energy and all other comparison devices consume more as well. Our review unit consumes 3.8 Watts on average when idle, and 5.8 Watts on average under load. We also like the very low consumption values when the device is turned off and during standby. The tablet actually does not consume any power when it is off, which is unfortunately still not a matter of course. The battery capacity did not change compared to the Galaxy Tab 3 10.1: The battery still provides 6,800 mAh or almost 36 Wh. This is quite a lot, and no device within the comparison can keep up with that. It is therefore not surprising that the measured runtimes are very good, which benefit from the low power consumption as well. 15:42 hours is the runtime of our review unit when idle, and you can browse the web via WLAN for 10:21 hours. 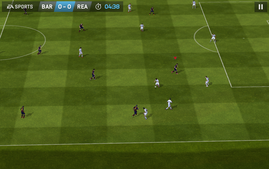 The LTE module affects the runtimes a bit if it is active, but it is still very good compared to the rivals. The Lenovo Yoga Tablet 10 HD+ on the other hand manages five more hours of web browsing via WLAN. This year you might get the impression that time has stood still: There are no real innovations from the new tablet or smartphone generations. Even the performance is often similar. 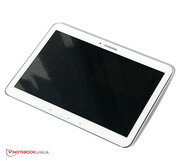 The Samsung Galaxy Tab 4 10.1 is no exception and is very similar to the predecessor, apart from the missing NFC and MHL. In return, you now get LTE Cat.4, which should be the biggest selling point. The Galaxy Tab 4 10.1 obviously does a lot of things right: There is sufficient performance for everyday tasks and smooth gameplay. The battery runtimes are slightly better, the build quality of the case is solid, and it has a simple elegance, at least if you can live with the plastic. 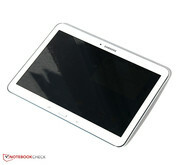 The good signal quality and the bright panel are other advantages of the tablet. The drawbacks are the low resolution and the strange color settings of the display; Samsung usually delivers better results. The poor cameras, the mediocre speakers and the somewhat strange keyboard layout without umlauts do not leave the best impression, either. In the end, you get a solid tablet with a phone feature, which does not really introduce any innovations or selling points over the predecessor. If you already have a Galaxy Tab 3, you can easily skip this generation. If you have to choose between the two generations, you should have a closer look, especially considering the reduced price of the Tab 3 10.1. If you want Full HD and a great price-performance ratio, you might want to look at other devices. In Review: Samsung Galaxy Tab 4 10.1. Review unit courtesy of Cyberport. 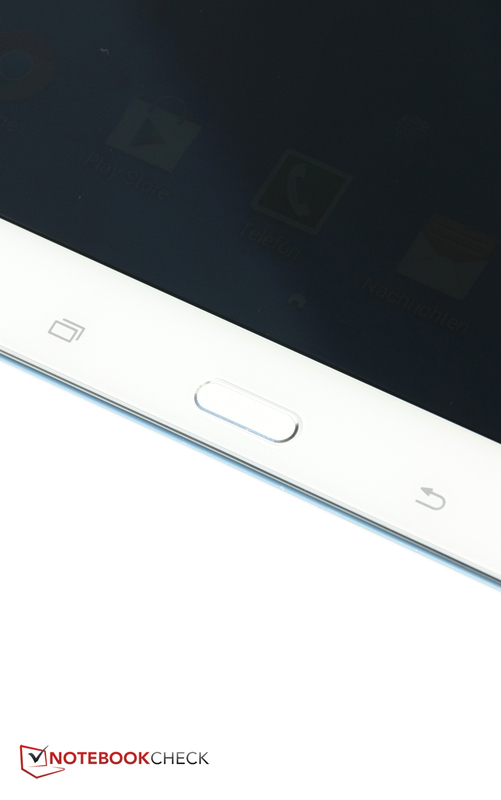 The Galaxy Tab 4 10.1 is a small curiosity. 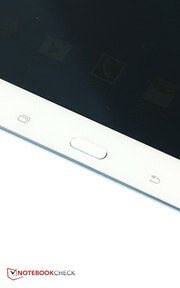 It is a 10.1-inch tablet, but you can use it to make calls. You can talk via speakers and microphone or with a headset. Polycarbonate chassis with a nice design. We like the grippy and convenient back. The cameras are unfortunately below average. Even the sensor at the back does not take really good pictures. 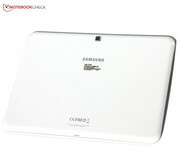 You can get the tablet in black or in white. You shouldn't expect too many changes compared to the predecessor. 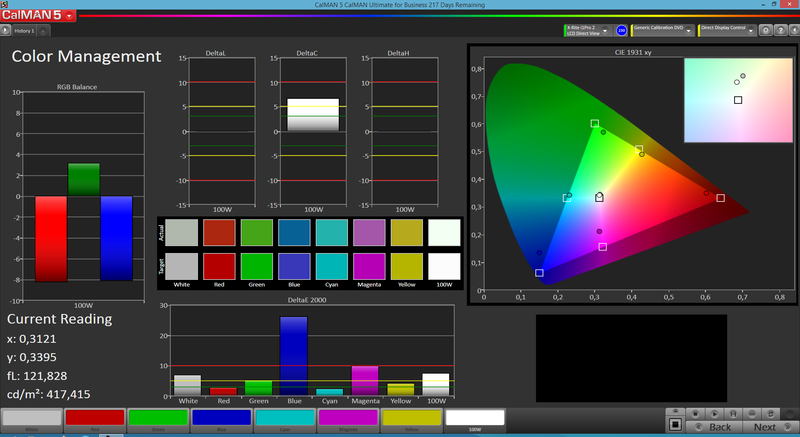 The panel still has the 720p resolution and somewhat strange color settings. 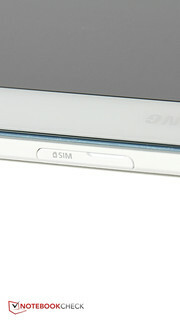 It is a bit tricky to insert and remove the SIM card. You can expand the storage via MicroSD card. The phone app is pretty clear. All in all a solid tablet with phone functionality. The nice case and the good battery runtime. Why does Samsung introduce a new generation, if there are hardly any changes.